Arsenal manager Arsene Wenger is targeting next season's Premier League title after signing a new two-year deal at the club. The agreement does not include a break clause and, should it be completed, will extend his reign to 23 years. Neither Arsenal nor Wenger, 67, see this as definitely being his final contract. "I love this club and I am looking forward to the future with optimism and excitement," said Wenger. Arsenal are expected to spend at least £100m on new players in the upcoming transfer window - which opens on 1 July - having also spent around that figure last summer. "This is a strong group of players and with some additions we can be even more successful," Wenger told the club website. "We're committed to mounting a sustained league challenge and that will be our focus this summer and next season." The Gunners finished fifth in the Premier League this season, the first time they have finished outside the top four since the Frenchman joined in 1996. They finished 18 points behind champions Chelsea, but beat the Blues 2-1 to win the FA Cup at Wembley on Saturday. Wenger met club owner Stan Kroenke on Monday to determine his future, with the decision relayed to directors at a Tuesday board meeting. Following Wednesday's official announcement, chief executive Ivan Gazidis said: "There is no complacency anywhere at this club. "Our goal is to compete for and win trophies here and in Europe. Everything we do is designed to make that happen and we will be working hard on and off the pitch this summer to improve and make a strong challenge next season." American majority owner Kroenke said the Gunners' ambition was to win the Premier League and "other major trophies in Europe" under Frenchman Wenger. "It's what the fans, players, staff, manager and board expect and we won't rest until that is achieved - Arsene is the best person to help us make that happen," he added. 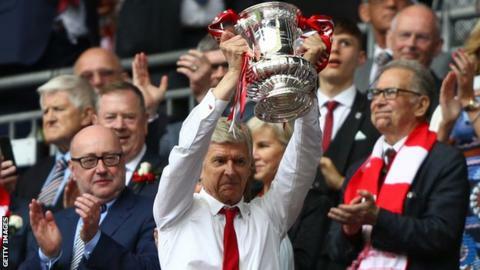 Uzbek-born Russian billionaire Alisher Usmanov, who made a £1bn bid to wrest control of the club from Kroenke earlier this month, said he was "pleased" Wenger was staying "as he is one of the very best coaches in Europe". However, Usmanov added it was "of paramount importance that he receives the full support of the board and majority shareholder". The metals magnate owns 30% of Arsenal's shares but is not on the board and plays no part in the decision-making at the club. "If the support is not forthcoming, we stand ready to step in and do everything we can to deliver success on and off the field," he added. Can Arsene write a new chapter in Arsenal's history? Although Arsenal may have £100m to spend, the issue is that they already have a high wage bill and their revenues are not as large as Europe's very biggest clubs. And that's before you factor in dropping down from the Champions League to the Europa League. They need to be careful when it comes to Financial Fair Play, meaning they will inevitably have to sell some players to free up funds for wages rather than transfer fees. It will be a busy few months at the Emirates. Decision to stay: "I identify myself so much with the club. When you can be where you love to be, that's easy. It's difficult because you want to respond to the demands of all the people who love this club." The fans: "Let's be together to support our players, to support the club and all give our absolute best to be at the level that we want to be. We can move up to the next level, I'm convinced of that, by having faith in the way we want to play football and by supporting the players we have already." Kroenke: "Our ambitions are unlimited. We live in a very competitive world where you need the support of the owner. He's highly ambitious and supportive as well so, on that front, we are all united with exactly the same targets." New signings: "We have a very heavy squad at the moment so maybe we might lose some players. We will work very hard to find the additions of top, top quality. I believe that our squad is very strong and we will only look for top-class people who can strengthen our team now." Wenger led the Gunners to three Premier League titles and four FA Cups in his first nine seasons in charge. In 2003-04, he became the first manager since 1888-89 to lead a team through an entire top-flight season unbeaten. But after winning the 2005 FA Cup, they had to wait another nine years - or 3,283 days - for their next silverware. It came as they beat Hull City to win the 2014 FA Cup, before winning the trophy again the following year. Arsenal are have not won the Premier League in 13 years and in 11 of those seasons have finished 10 or more points adrift of the champions. Arsenal have not qualified for the Champions League for the first time in 20 years - and many would believe an FA Cup triumph would be the perfect parting point, allowing Wenger to go out on a high and a successor to usher in the new era. Wenger does not think in those terms. He is the eternal optimist who has never felt Arsenal were far away from recreating a title-winning team, even though the evidence against has piled up before him. A section of Arsenal's support have organised protest marches and made their discontent clear as Wenger's side once again failed to halt a barren title sequence stretching back to "The Invincibles" season of 2003/04 - with the manager describing some of his treatment as "a disgrace". However, he is committed as ever, even after 1,175 games as Arsenal manager, 676 wins and a remarkable win percentage of 57.5% - but did Saturday start a new era of success that can emulate his early glories, or will he simply face the same criticism again at the first sign of trouble next season? Match of the Day presenter and former England striker Gary Lineker: "Arsenal have got a long way to go at the moment. If you ask me now whether they are going to be in the top four next season, I would say most probably not. They are further behind than Wenger thinks. "The only other example of a manager that decides when and where he goes is Sir Alex Ferguson, but he was still winning league titles. "Arsene Wenger was still winning FA Cups and until this season he had always got in the top four, but now that's changed." Former Arsenal goalkeeper Bob Wilson: "Without the Champions League, the only way is if you can compete salary-wise to attract the players. "Chelsea bought the best player available last season in N'Golo Kante and Arsenal went for him too but came nowhere near the salary that Chelsea pay. "Arsenal cannot compete with Manchester United, or Chelsea with all the money Roman Abramovich has, or Sheikh Mansour has at Manchester City - these are clubs who can manage to go into huge debt." Arsenal Supporters' Trust spokesperson Tim Payton: "The reaction is very mixed - we recently surveyed our membership and 78% thought it was time for a change. "We all want to see Arsenal win and we will get behind the team, but they need to get on top of this summer. They've got the contracts of star players Mesut Ozil and Alexis Sanchez ending and they've not got a good track record of being decisive and quick in the transfer market. "No one should be abused but every supporter has a right to a voice and it is concerning to see Wenger challenging his own fans and if I look across the football world it's never ended well when a manger falls out with his supporters." Arsenal Fan TV founder and presenter Robbie Lyle: "Now the announcement has been made, fans might start to get behind Wenger. "It's all going to depend on what kind of summer Arsenal can have and whether they can bring in some transfers that excite the fans. We need to add to the squad but he do have a lot of quality players and it's vitally important to keep Ozil and Sanchez. "But what about the first time we lose back-to-back games next season - if that happens, will the atmosphere become toxic again?" Ally McIntosh: "He's purely in it to try and pass Sir Alex Ferguson's 26 years. Not to win things." Si Hawkes: "We'll be having this same conversation in two years after he's signed yet another two-year deal." James Tall: "Another two years of inconsistency and fan frustration." Alex Maple: "More work for pilots of small planes and banner makers." We also asked you on Tuesday to vote on whether Wenger staying is a good thing for Arsenal. There were more than 250,000 votes - 58% said yes and 42% said no. The Gunners secure their first league title in Wenger's first full season in charge as they thrash Everton at Highbury. They would go on to complete the Double by beating Newcastle 2-0 in the FA Cup final at Wembley. Wenger's side seal their second Double by claiming the Premier League title at Old Trafford with the only goal from Sylvain Wiltord, days after beating Chelsea to win the FA Cup at Millennium Stadium. Arsenal come from behind to beat Leicester and become the first side to go a whole league season unbeaten since Preston in 1888-89, with the 2003-04 subsequently known as 'The Invincibles'. Wenger's side had already wrapped up the title with a 2-2 draw at North London rivals Tottenham. Thierry Henry scores a hat-trick in a fitting finale to Arsenal's time at Highbury, before moving to their current Emirates Stadium home. Victory over Wigan also secured fourth and a Champions League spot. The only time Wenger has reached the Champions League final saw Barcelona score twice late on to down Arsenal, who had goalkeeper Jens Lehmann sent off on 18 minutes. The nadir of Wenger's time at Arsenal? A rampant United brutally humiliate the Gunners at Old Trafford. Aaron Ramsey's extra-time winner ends Arsenal and Wenger's nine-year wait for a trophy. They would go on to win the 2015 and 2017 FA Cup finals. Can Arsene Wenger write a new chapter? Read more on 'Wenger in' - can Arsene write a new chapter into Arsenal's history?